Latest Marvel offering is a matter of life and comic-book death. There’s dead, and then there’s comic-book dead. Anyone who grew up reading tales of super-heroes understands this, in the same way that anyone who watched daytime (or nighttime) soap operas understood it: Nobody is so clearly and obviously deceased that he or she can’t make a shocking reappearance at some later date. The lead-up to Avengers: Infinity War—the culmination of an epic decade-long storytelling process—has been full of speculation about which characters might not make it to the as-yet-untitled Avengers 4 in 2019. That massive sense of consequence is the pivot point for the entire narrative, yet how can it really land emotional body blows when this mortality merry-go-round is a feature of the system, not a bug? 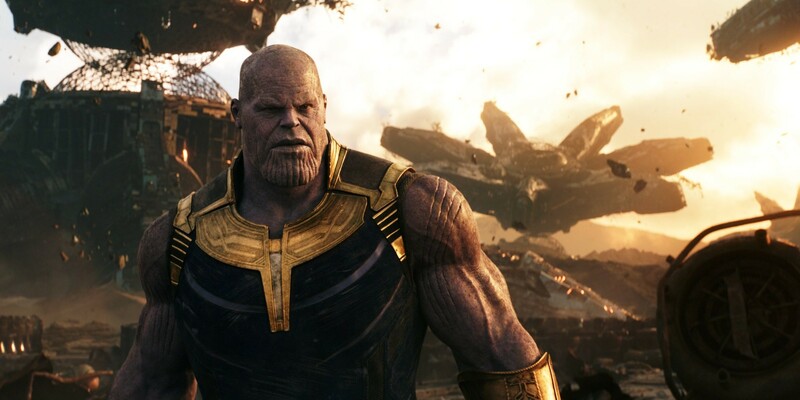 Ever since his post-credits cameo in 2012’s first Avengers feature, Thanos (voiced by Josh Brolin) has been the harbinger of doom just waiting for his moment in the spotlight. We’ve been introduced in previous films to multiple super-powerful Infinity Stones—in the amulet worn by Doctor Strange (Benedict Cumberbatch), on the forehead of the android Vision (Paul Bettany), etc.—and Thanos is at last ready to gather all six of them into his gauntlet, giving him power over the existence of every living being in the universe. Those are big stakes, and everyone involved here is aware of it as they team up in various permutations to try to thwart Thanos’ plan. It’s in this way that the massive cross-over event provides opportunities for unique character interactions, whether it’s Thor (Chris Hemsworth) attempting to restore the equivalent of his lost hammer with the aid of Guardians of the Galaxy's Rocket (Bradley Cooper) and Groot (Vin Diesel), or Star-Lord (Chris Pratt) trading pop-culture references with Spider-Man (Tom Holland). And there are several moments for individual characters to flash the personality we’ve gotten to know, like Robert Downey Jr.’s Tony Stark getting an incredulous deadpan reaction take that gets funnier the longer directors Joe and Anthony Russo improbably hold it. On the other hand, the Russos also don’t have to provide a ton of those moments, because so much of the character-building heavy lifting was done for them in the earlier movies. With most of these people and their relationships already established, the bulk of Infinity War’s 150 minutes can be devoted to battle sequences—in space, on alien worlds, in the middle of New York streets, on the plains of Wakanda—which of course involve massive numbers of some sort of dispensable alien creatures. Thanos himself is the one significant new piece of the puzzle, and he’s actually a surprisingly complex antagonist, given the number of interchangeable monomaniacs the Marvel Cinematic Universe has trotted out. But there’s almost never time for Infinity War to breathe. It feels less like a movie in its own right, and more like the 2-1/2 hour non-stop finale of the 10-year-long, 18-movie-long, 40-hour-long MCU experiment. Which it pretty much is. Is it venturing into spoiler territory to say that not everyone comes out of that experiment alive by the time Infinity War’s credits roll? Plenty of folks have made their guesses as to which characters those might be, and to give credit to the Russos and screenwriters Christopher Markus and Stephen McFeely, they don’t always come when, or to whom, you might expect. Ultimately, that sense of surprise isn’t particularly relevant. Whether out of simple common sense or because we know what movies are still scheduled to come down the pike for Marvel Studios, it’s patently obvious that one or more of the deaths in Infinity War will be miraculously erased/reversed/undone within a year or two. Without that sense of permanence, any momentary shock has no chance to linger; it all feels as genuinely dangerous as one of the cliffhanger episodes of the 1960s Batman TV series, where the only question isn’t whether our heroes will survive, but how they’ll get out of their predicament. Infinity War can’t lean into the sense of fun that elevated several of the other Marvel films, because the whole idea here is that it’s a matter of universal life and death. For all the spectacle on display, after 10 years, 18 movies and 40 hours, it’s simply a matter of life and comic-book death. Mark Ruffalo, Chris Evans & Co.